According to the Royal Astronomical Society of Canada, the youngest person to discover a supernova is a 10 year old girl from New Brunswick. Kathryn Gray is ten years old, has three siblings, and is an amateur astronomer. She can now also claim to be the youngest person ever to discover a supernova. She scans the night skies with her father, former astronomy technician Paul Gray, and from their home in New Brunswick, the two of them identified a stellar explosion 240 million light years from Earth, in "galaxy UGC 3378 in the constellation of Camelopardalis," according to the Globe and Mail. The pair were sitting at their home computer, looking at images taken from a telescope in Halifax and sent to them for observation. Both father and daughter noticed the white spot, and commissioned a photograph of the same spot a few hours later, to confirm the spot wasn't an asteroid or comet, just passing through. 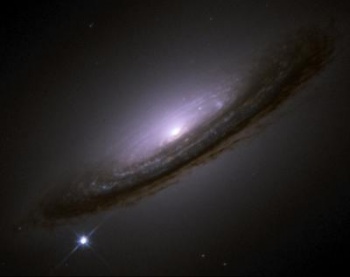 Once confirmed, the Grays ensured the supernova had not yet been identified. Kathryn was asked to describe her discovery, and she kept it simple: "It's just a really old star, really old. So, it just blows up," reports the Globe and Mail. When news of her discovery began to spread, adults around her began assuming a career in space travel. The Globe and Mail quotes Kathryn as replying she isn't interested, saying, "Looking from the Earth is fine. No, I probably will not go up there."